The NHS Commissioning Board (NHS CB), plays a key role in the Government’s vision to modernise the health service with the key aim of securing the best possible health outcomes for patients by prioritising them in every decision it makes. Formally established as an independent body, at arm’s length to the Government, on 1 October 2012, it will carry forward the preparatory work begun as the NHS Commissioning Board Authority while taking on initial statutory responsibilities. The most notable of these responsibilities being the authorisation of clinical commissioning groups (CCGs) which are the drivers of the new, clinically-led commissioning system introduced by the Health and Social Care Act. 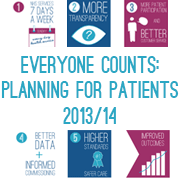 The NHS Commissioning Board will take up its full statutory duties and responsibilities on 1 April 2013. Read more about the NHS CB.